Not only am I a frequent visitor of Low End Mac, above all we share the same love for Macs (old and new). I would like to share the following story with you. How it all begun is a long story and can be read on my site (link below), but suddenly 1,500,000 American newspaper readers were aware of the fact that I had bought two chickens, Thelma & Louise. 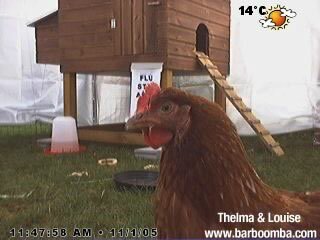 It started with my personal interest in animal cams, and it ended up with the fact that I was forced to set up my own chicken webcam. I was dreaming of a wireless network camera to bridge the distance from the hen house to the router in our house, but my budget was rather tight. So I looked in my garage, where two old Lombards were laying around, both broken if I recalled correctly. Indeed, neither of them were alive, but putting the hard drive from one Lombard in the other one gave me a spinning sound, and suddenly the old Mac OS 9 welcome screen was laughing at me. Would OS X work on this baby with a 6 GB hard drive and 128 MB RAM? I installed 10.2 and - go, tell it to the mountains - it worked (not blazing fast, but stable). Next I took an old Orinoco wireless card and the Lombard was surfing with my wireless ADSL modem with the help of WirelessDriver. Last but not least: Would the Orinoco card bridge the 30+ meters from inside the hen house to the modem, hidden behind concrete on the first floor of the house? It does it flawlessly. Thanks to another oldie webcam application, every 30 seconds Oculus takes an image from a Logitech 4000 camera and sends it through FTP to Thelma and Louise's website. Since Europe is under the threat of the bird flu, Thelma & Louise became the symbol of the fight against the forced quarantine and massacre of domestic birds. Newspapers, radio, and television are all bringing Thelma & Louise into the picture, and thousands of visitors are watching these funky chicks daily. But for me, as a Mac lover since 1986, it's above all a proof that old Mac equipment does have a second life.